Botticelli birth of Venus is one of the symbols of Florence Italy Renaissance. Sandro Botticelli created this painting for the Medici family, which hangs in the Uffizi Gallery in Florence Italy, before 1485. Giorgio Vasari wrote about it in his Vite, the first form of an encyclopedia of art. The order for this painting came probably from Lorenzo de Medici, the destination for The Birth of Venus probably was Lorenzo di Pierfrancesco de’ Medici’s Villa di Castello: it was ordered to be a painting staying inside the villa as a private piece of art. This is not sure, however. Because the scene that is shown on the painting does not represent what the title suggests there is a great deal of controversy amongst art critics (who else?). The title, The Birth of Venus, suggests the painting displays the rise of an adult woman, Venus, rising from the sepiolite, as described in the old Greek mythology. 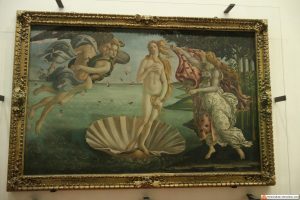 The painting clearly does not display Venus rising from sepiolite but from a shell, showing her arrival at Paphos, Cyprus. This is why some critics suggest that the painting called The Birth of Venus as described by Vasari is not actually this painting at all but a different painting by Botticelli, which was lost in history. 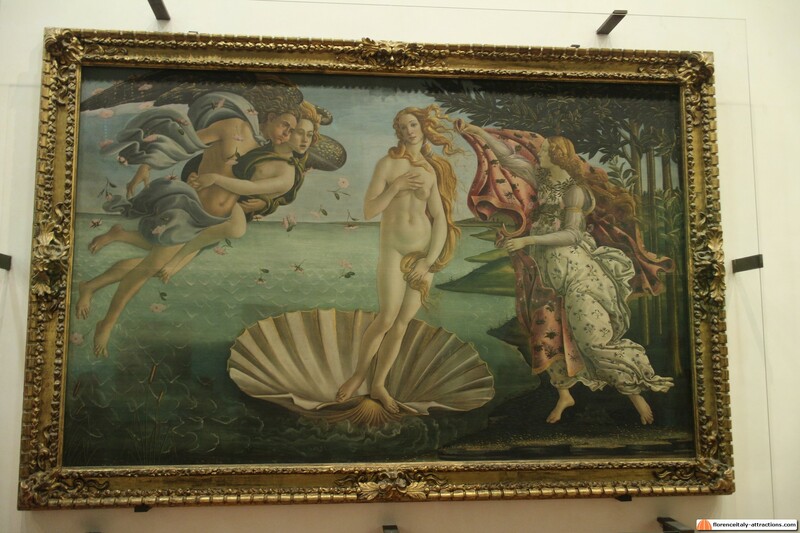 The painting we now know as The Birth of Venus could have been a painting Botticelli painted for Giuliano di Piero de’ Medici, portraying his beloved Simonetta Cattaneo Vespucci, with the shell representing the female body. This painting would have had a different name than what we now give it. Fact is that The Birth of Venus by Botticelli is one of the most famous and stunningly beautiful pieces of renaissance art, painted by one of the most talented painters of the renaissance. could I please have the catalogue number of the birth of Venus? Hi Nogah, to be honest I don’t know if the Uffizi has a catalogue. They have an inventory though, and the Birth of Venus is reported as “Inv. 1890 n. 878”. I hope this helps.